Find Amanda at Chapel House on a Tuesday, Thursday and Friday morning for ZUMBA. Every class feels like a party! Come join in and you'll see what we mean. You don't even have to know how to dance. Just move your body and follow Amanda's lead. It's easy! Come try it, we guarantee you will have a blast. We look forward to meeting you! Victoria was drawn to Barre because of the combined elements of Ballet conditioning, Pilates, Yoga, Strength training and great music! She quickly realised this accessible style of mindful fitness would have a positive impact on other women’s lives too. As a working mother with two young children, she knows how precious time is and how important it is to make space for an intelligent workout that delivers positive results and how vital it is to invest in your own health and happiness too. She loved the energy Barre brought to her life, the positive changes to her mind, how strong she felt in her body and the effects on her overall health and energy levels. Victoria teaches an Authentic USA style class, directly inspired by the Mother of Barre, Lotte Berk. Victoria’s classes are empowering, upbeat and will leave you feeling strong, beautiful and glorious inside and out! 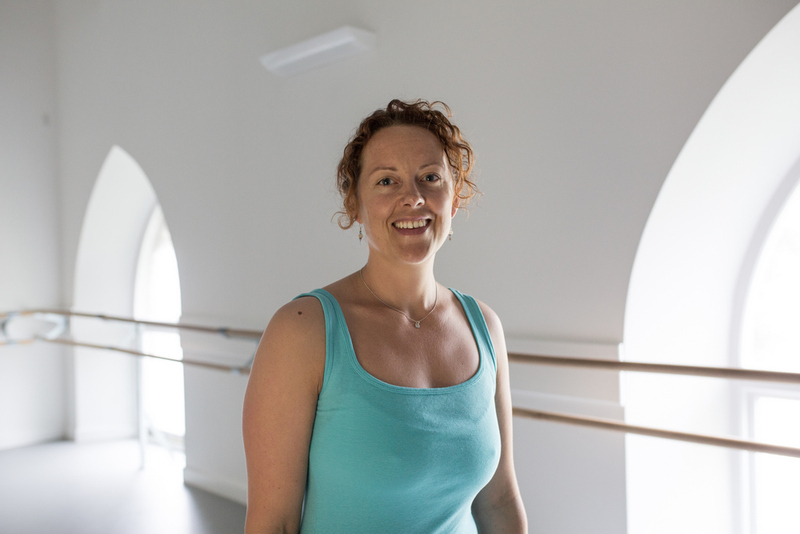 Victoria is the founder and owner of Chapel House Studios Victoria is also a Royal Academy of Dance mutually recognised teacher. My personal challenges with pain, disability, and subsequent rehabilitation have only served to inform my teaching style and fuel my compassion to be able to support and encourage you to be the best you and your body possibly can be. I have been fortunate enough to be able to learn and study with two of the foremost Pilates teacher training providers in the world; Body Control Pilates and Polestar Pilates. I work with a unique method of retraining the body to restore natural, normal movement. Alongside our busy Pilates Mat class schedule, we run a full timetable of group and private classes in our fully equipped Pilates Studio on the ground floor of Chapel House. Here we have the privilege of a beautiful space, equipped with the very latest Pilates machines. Whether you are looking to facilitate recovery from injury, are an athlete looking to improve your performance, or somewhere inbetween, our experience, attention to detail and highly specialised equipment, will ensure you get the very best Pilates experience. I encourage you to contact me, or one of our team, and we can talk about which classes/sessions are suitable for you. There is a Pilates way for anybody who wants it, and it's my job to find the way that is right for you! Pollyanna and her expert team of teachers run the children's dance school at Chapel House - Buckingham Dance Studios. Classes are available for children from age 2 years old and upwards. But you don't have to be a budding ballerina to dance! With plenty of Modern, Tap, Acro and Contemporary dance classes, you're sure to find a style that suits your child's personality. Dance is an amazingly fun, creative and exciting way to help your child to exercise and develop co-ordination and rhythm. It's an opportunity to be a part of something they will remember all their lives. We are both registered physiotherapists and qualified yoga teachers. We have a wide range of experience in the NHS and private clinics, in the UK and overseas, and currently work in sports injury clinics across South Devon. Our diverse experience and training gives us a unique, holistic and evidence-based approach to therapy and yoga. We recognise the value of yoga as an important tool for rehabilitation and pain management, often incorporating the techniques into our physiotherapy treatments to help people understand their bodies better. Equally, we use our physiotherapy expertise to guide our yoga classes and tailor them to meet the varying needs of our students. We are passionate about exploring the diversity of physiotherapy and yoga, and where it takes us. We have run courses, training yoga teachers and physiotherapists, working at hospitals, events, and alongside NGO’s in various locations across Africa, Asia and Europe. We moved to the South Hams in 2016, after travelling for a year and a half, and established The Yoga Physios. We now live just outside Totnes, where we are enjoying the tranquility of this beautiful area and hanging out with our baby, Sumaya. I combine my knowledge and experience of yoga and massage therapy to create classes and workshops that enourage students to take control of their health and healing by focusing on their specific problem areas. I help students on part of their journey into developing a deeper relationship with their bodies at all levels. Clients include a range of abilities from absolute beginners, students who are returning to their mat and/or exercise after a long break and to students with a regular practice who want to advance further. I also specialise in helping clients overcome psychological issues such as stress, anxiety and low self esteem. I travelled and worked around the world for two years before settling in Koh Lanta, Thailand. I trained and worked there teaching yoga classes and workshops for 5 years before returning to Totnes to start a wee family. I originally started yoga to help calm my mind and keep me sane, and continued to practice in the hope of achieving Madonna-esque arms. I can definitely claim to have a calm mind (most of the time) and I defintiely have sane moments. The arms....I am still waiting. I am a full member of IYN (International Yoga Network). Having experienced first-hand the benefits of practising yoga throughout my own pregnancy, birth and beyond, I was inspired to teach yoga to all. I have over 21 years of experience as a nurse and a health visitor and have been practising yoga since I was a child. I qualified as a yoga teacher in 2008 and have since specialised and gained extra training and qualifications in pre and postnatal, baby, toddler and pre-school yoga. I look forward to meeting you and your bumps, babies and toddlers! Having studied and practised Yoga for the past 13 years and Triratna buddhist meditation since 2007, I studied at the Devon School of Yoga completing the teacher training course in the summer of 2014. I led meditation groups weekly in Totnes for 2 years, until my yoga teacher training commenced, and now the two combine harmoniously in my class, both gentle and physically invigorating! I have studied and practised (and continue to!) with many different teachers with so many refreshingly different approaches, which leaves me with an abundant "toolbox" to dip into in order to make each session unique to the people attending, the time of year, even the time of day! It makes Yoga more fluid, interesting, fun, and helps us to appreciate the preciousness of our bodies, no matter what shape we're in. We are a married couple, both passionate about movement, health, mind-body connection, mindfulness and conscious growth (amongst many other things!) Excited to be working in an era where movement is increasingly known to be a vital component of general overall health and lifestyle quality, we aim to offer focused, gentle, structured movement and relaxation sessions that are more accessible to more people. Additionally, in our 50s and 60s ourselves, we are particularly interested in the benefits of continued movement - and movement class provision - as we age. One of our primary aims is to support your education and self-empowerment so you can become increasingly resourced with regards to your movement, balance and fitness to help you carry out your everyday life, and leisure, activities confidently, comfortably and competently and enjoy life more.